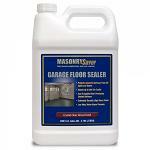 MasonrySaver Garage Floor Sealer is a non-yellowing acrylic polymer blend sealer formulated for sealing properly cured concrete surfaces. Garage Floor Sealer is suitable for use on a variety of surfaces where a durable gloss finish is desired including garage floors, concrete patios, driveways and sidewalks. It leaves an attractive, durable, gloss finish that protects concrete from moisture, oil stains and abrasion/wear. LIMITATIONS: Not suitable for use over asphalt surfaces. Do not use on below-grade surfaces that are subject to severe hydro-static pressures. When using in areas subjected to hot tire traffic, allow adequate time for product to cure before putting the area back into service. When applying over previous coating, hot tire resistance maybe compromised. Do not use if the area will be exposed to softer, high performance tires. Product will not withstand brake fluid and will need to be reapplied in areas where brake fluid spills have occured. Surface Preparation: Always test in an inconspicuous area to ensure desired results. Protect all non-targeted surfaces that may come in to contact with the product. Use polyethylene or other tested material for protecting other surfaces, such as glass, foliage, siding or painted surfaces. Cover all openings including windows and doors prior to application. During use, avoid wind drift that may injure pedestrians, damage vehicles or adjacent properties. Remove any overspray immediately with soap and water. Dry film can be removed using a razor scraper. When using, surface to receive application should be clean and dry. Absorbed moisture should not be present. New construction should cure for a period of 30 days. FOR NEW CONCRETE: Use MasonrySaver No-Rinse Etch to etch the surface. Allow to set for 30 minutes then apply Garage Floor Sealer. Note that No-Rinse Etch will etch the surface but does not clean any dirt or staining. If concrete needs to be cleaned and etched, use MasonrySaver Safer Masonry Cleaner. Please note that using Safer Masonry Cleaner will require a thorough rinsing with water and 3-5 days dry time. FOR EXISTING CONCRETE: If the surface is already clean, No-Rinse Etch can be used for etching followed by a sealer application 30 minutes later. Otherwise use MasonrySaver Safer Masonry Cleaner to remove dust, curing compounds, efflorescence, coatings and other foreign materials in order to expose a clean, sound surface. It is extremely important to rinse the surface thoroughly with water after using Safer Masonry Cleaner to bring the substrate to a neutral ph level (7). Testing with ph paper should be done prior to using Garage Floor Sealer to ensure that a neutral ph has been achieved. After rinsing, surface should be allowed to dry a minimum of 3-5 days prior to sealing. Applying sealer over an acidic substrate will most likely result in failure. If oil or grease stains are present, use MasonrySaver Cleaner & Degreaser to remove stains prior to cleaning/etching. Mixing: Material may separate during long-term storage so mix thoroughly before use. Apply two uniform coats of material to new, previously untreated concrete surfaces. Allow the first coat of material to dry sufficiently to walk on, but not more than 4 hours, prior to application of the second coat. MasonrySaver Garage Floor Sealer may be sprayed applied using a pump-up, “garden type” sprayer with fan type nozzle, with an airless sprayer, pad appliactor or by roller. If roller applied, use a short nap cover. Avoid puddling or ponding of product: brush or roll material until it thoroughly penetrates the surface. Block all drains and use absorptive coverings to contain run-off or excess material. Use soap and water to remove overspray as soon as possible. CAUTION: Treated surfaces may become slick when wet. To provide a non-skid surface, consider broadcasting silica sand, synthetic aggregate or other skid-resistant additive to surface per aggregate manufacturer's instructions. For more information and specific recommendations, please visit saversystems.com/nonskid. Drying Time: One to two hours, depending on temperature and humidity. Allow 4 - 6 hours cure time before exposing to foot traffic. Allow 6 days cure time before exposure to heavy traffic, such as forklifts, automobiles, etc. Clean Up: Thoroughly rinse spray equipment with clean water. Clean applicators with soap and water. Rinse thoroughly. Coverage: 100 - 150 square feet per gallon on concrete. Note: coverage rates will vary based on the porosity of the substrate. Keep out of reach of children. Keep container closed. Eye irritant. Avoid contact with eyes, mucous membranes and prolonged contact with skin. The use of chemical splash gloves and a NIOSH approved respirator, effective against ammonia inhalation, is highly recommended when using this product.